There's been a lot of media commentary lately extolling that the global economy has decoupled from the US, or not. I kind of think it hasn't, it made a good attempt to, but when push came to shove, the real pain has actually been felt in far east markets more so than North American. But I digress. The real reason for this post is to ask the simple question: has the Victoria real estate market experienced its own internal decoupling? I ask a simple question. There can be no doubt that in the new condo offerings at minimum, it is a serious buyer's market. I think there is argument for and against a balanced market in SFH above $600K. I think there is a frothy effect in SFH homes priced between $500K-$600K, where quality of product trumps quantity of offerings. And I think that SFH below $500K and resale condos below $300K continue to be a warm seller's market, though clearly becoming more luke and less warm as each week takes us deeper into 2008. Will the so-called selling season of March-June change this perspective? Can the resale condo market continue to be unaffected by new condo lack-of-sales? Can the condo market (traditionally more volatile) continue its course without affecting SFH sales? What do you see happening out there? I've lived in Calgary, Halifax, Banff, Edmonton and Victoria. Victoria is home. I wasn't born here. But if I were asked where I'd like to spend the rest of my days, if I had to spend them in one location, I'd be an Oiler fan in Fairfield. I was at a party for a friend on Saturday night. It was hosted by a doctor. The house was really nice. It was around 1300SF. It had character. It was unique. It was small. It was livable. It was everything Ms. HHV has dreamed about. A modest house. A character house. A great neighbourhood. Too bad it takes a doctor's salary to afford it though. Actually that's not true. It takes a doctor's salary to own it. We used to live one block over from this house. There were three of us sharing a 3 bedroom house that had a bachelor suite in the basement. We chose not to rent out the suite because I liked having a second bathroom I could use and Ms. HHV liked having a private place she could go and paint in. The whole house, all 2000SF of it, cost us $1250/month plus utilities. It worked out to about $500 each. That was only two years ago. We moved so I could be closer to school and we could sell a car and start saving the difference for a down payment. I believed the market was due for a correction then too and naively thought that when I was done school we'd have enough saved to put a down payment on a modest bungalow with a suite in a neighbourhood we could live long-term in. I was wrong, obviously. I didn't think we'd afford Fairfield, but I figured we'd get in Cedarhill or Fernwood no problem. Back then, small fixer uppers were around $300K; I'd been looking for a return to $250K-$260K prices. Fairfield was the goal: walk to work downtown, great coffee, short ride to the waterfront loop to Sidney, short drive to the pool, beautiful neighbourhood etc, but we could definitely live elsewhere happily. So we've been talking about this house party. And that talk has me thinking: could we ever afford Fairfield? Turns out we can. Because despite what some would have you believe, I still think that we can afford this lifestyle choice by renting. Our rent would go up a bit, from $850 including utilities to likely close to $1200. But we'd be looking at a bigger place. If you look at some of the rentals on Craigslist and UsedVictoria, or over at duttons.com you'll see places, mostly suites, for rent in Fairfield for anywhere between $600-$1200 depending on size and rooms. Rents have increased, but not anywhere near as fast as prices. We've decided to stay where we are and continue saving. If the market doesn't turn, we may leave, we may stay, we may move in town and rent somewhere new. It really doesn't matter. This town has beautiful neighbourhoods, despite the insanity that is the residential housing market. The point is, if you rent, there are some great affordable places. I still don't believe that the prices are remotely justified in terms of the amenities or locations. There was a stat posted somewhere in the comments over the past couple of weeks about how 3%-4% of property changed hands in Victoria last year. Talk about out of whack: 3%-4% of properties dictating what a market value is worth. When is an economist not really an economist? How about when they work for the RE association? Take this for example, under the heading on MSN as "can US fears hurt our real estate?" Which, funnily enough, gets re-named "US slowdown may boost Canada's real estate market" once you click on the link. The prospect of a U.S. recession has some homeowners and prospective buyers nervous about the impact on the real estate market in Canada, but one economist says a slowdown could actually boost activity in Canada's housing sector. "The chances are about 40 per cent, but the U.S. Federal Reserve is expected to cut interest rates and do so very aggressively to prop up their growth and keep them out of recession,"
"So while they're heading for a soft patch of growth it's an open question whether they'll enter a recession. My own thought is no, they won't." Which means, they'll actually keep buying in Victoria then eh Greg? News flash: recession is here. But of course, they weren't saying that in the US back in 2005 at their peak either, or were they? "Softer growth means lower interest rates and lower interest rates are positive for the housing market," he said. "Toronto is primarily a finance-based city and our economy is doing very well, and as long as that continues, the real estate market here should continue to be healthy,"
I guess they've been too busy selling condos to pay attention to what has happened to the financial markets, and in particular to financial stocks since January 1. They must think we're stupid. As an aside: thanks for the great discussion this past week. We've enjoyed reading it immensely and hope it keeps up. It's why I blog. My hats off to you all. Cheers. I've just realized that PB linked to this article already H/T. Welcome back too PB, we've missed you after 11 days. Video courtesy of VK: cheers. Say I'm a stock broker who calls you up and says "Have I ever got an investment for you. Over the past 60 years this investment has doubled every ten years. If you had put $50,000 in it 30 years ago, you'd have almost $403,000 today and you wouldn't have to do anything. Just sit there and watch it grow." What would you think? No brainer, right? So me being the smart bloke that I am, I'd realize that I was wasting my time phoning people to tell them of this deal. It would be far more advantageous if I found a good-looking person and made a commercial so I could tell hundreds of thousands of people about my investment that I'd found. It's the same principle that applies to all those late night, get-rich-quick from your one-bedroom apartment by placing tiny little classified advertisements in thousands of community newspapers selling nothing much at all. Now that's a mouthful. So what's preventing me from pulling this off. It's not money. My investment is guaranteed. I have 60 years of history to take to the bank to borrow money for my advertising campaign. Except that I have to run one tiny little sentence at the end of my ad. I have to do something that pretty much everyone who sells any kind of "investment product" has to do (with one exception) I have to write it on the screen and I have to say it out loud: "Past performance does not guarantee future results, these results are not typical." Now I'm sure you know where I'm headed with this. This isn't a swipe at any particular individuals who sell real estate. This is a complaint about the profession of real estate sales. They're self governing, so I guess you'd win an argument that this is a swipe at everyone who sells real estate, except that in a democracy, the few can be outnumbered by the many, so I'll use this disclaimer: one bad egg does not necessarily represent the whole carton being bad, check your eggs carefully, we do not take responsibility for the fact that the good eggs did not outnumber the bad. There is a series of Realtor commercials running in the states telling people exactly what I stated above: 10 years to double your money, history is the guarantee. Watch the videos. See if you can find the disclaimer. If you can, I'll give you ten bucks. Disclaimer: you'll notice I used ten bucks to represent an imaginary monetary sum. I will also make you aware that current hunting licenses prevent this writer from actually getting you ten bucks, so don't ask if you prove me wrong, you will only be disappointed. A quick search of the Realtor.org site will produce hundreds of links to one kind of disclaimer, but it has nothing to do with economics, it just says we won't discriminate against anyone's human rights. A quick search of the CREA website turns up even less. Me thinks that after the bubble bursts, many people will be seeking legislation that forces adequate disclosure and separation between being a Real Estate Professional and being an "Investment Advisor." Oh and by the way, for RE to double every ten years "or so" requires an annualized rate of 7.2%. Realtors are calling an average of 6%. What's the difference? Only 2 years. And if you owned a house for the last two years in the US, you may find yourself cursing that "advice." Now I'll add the final disclaimer: before you go dismissing me as a ranting bitter renter, I'd like to point out that this post is in jest, for the most part (I still think they shouldn't be allowed to talk about "investments") and the fact that I have to point out it is meant to be more funny than serious means its likely more serious than funny. I've never been accused of being a comedian. So sue me. No, wait. According to census data, just over 21,000 people moved to the CRD between 2001 and 2006. According to BC Stats, just 11,776 new units of housing were created. 21,000 at 2.3/household would need about 9130 units of construction. We know that approximately 40% of Victorians don't own the homes they live in, so is it fair to assume that the new unit construction would break down roughly the same? Seems to me there are too many units, and too few owners, and too few immigrants, and two few... you get my meaning. Are we overbuilt? If so, by how much? I see stats that say we have 7-9 months of inventory right now. Usually that's a buyers market. Is this a buyer's market? Sellers? Update: H/T to Nick in comments for corrected math. So we nearly bought. Someone very close to us is working very hard to help their kids get into the RE game. Not as investors, but using the "paying rent to yourself is better than to your landlord" belief. We will benefit directly from their generosity. For that, we are extremely grateful and felt somewhat compelled to take them up on their offer. This person owns a 2-bed 2-bath condo, in-suite laundry, very close to downtown. It falls in the downtown catchment of MLS, but I hesitate to compare this property to other downtown condos, that are more, well, downtown. It is worth more than we would have considered spending in our search. It is somewhere we we discussed we could live for the next 5-7 years if need be (market or other financial issues dependent). Through some gifting (no we wouldn't owe this money) we were set to get into this property for a perceived 15% discount from where this person felt it will be priced when it goes on the market. Honestly, if our own financial situation was different, like say where we plan to be in 12 months, we would have jumped on this regardless of my bearishness on this market (for the record, Ms. HHV does not share the same bearishness, she's certainly no bull, but let's say she's more of a JMK-type who sees value in this market and a soft landing and continued growth at 3-5% over the next few years). Despite this, we get on very well. Now our financing situation is a wee bit complicated. We had a bit down, we have a bit of outstanding student debt and the price of this place was such that our entire debt would have to be retired in order to get traditional mortgage financing. When we sat down with the banker, we qualified, but it required a higher interest rate than we are comfortable with and a longer term than we'd like. "I wouldn't recommend you get into this." "Look at how many condos are set to come online and how many units haven't sold yet. There's your answer." Anyway, to make a long story short, we nearly bought, it didn't end at the trip to the bank either. When we went to tell the seller the news, they bent over backwards to help us even further. It was really difficult to say no. But at the same time it was really easy. Like I said in the title, a 15% gamble. Not really actually, it works out much less when we take time, interest and any other number of factors into it. CBC MARKETPLACE has a special on condos tonight at 7:30 on Ch2. I'm watching now on CBC Winnipeg. You should watch this if you are thinking pre-sales are good deals. It is seen as our "Yaletown"
Get ready to reach for a tums. I swim fairly regularly at the Crystal Pool. I like the facility, the staff are really friendly and they try very hard to keep the facility secure. They even let me take my stuff onto the pool deck in the early am during club swim times. That said, there are signs everywhere warning you not to leave valuables in your car or in their lockers. They have a theft problem. When I drive north on Quadra Street, right at the corner of Bay and Quadra, there used to be an obvious crack house that sat empty and un-rented for at least a year. I guess the owner got tired of dealing with problem tenants. The neighbourhood has a high ratio of rental properties to owner occupiers and the condo building on the north side of the Bay/Quadra intersection is strictly a rental only building. Family and owner occupiers are not allowed. Back to the house. A while ago, maybe a year and a half ago, Large and Co bought the place, raised it up and set about "revitalizing" it. Good on them. It's now on the market. I figured, with the neighbourhood, location and all, that they would be listed around $250-$300K depending on square footage. The last 3-4 weekends they've been having open houses, despite not listing the places on the MLS. Curious, we went by today. Let me say I was disappointed on two fronts. First, the place, while nice looking, smelled terrible. And not the new paint and carpet glue headache-inducing smell, but the "there must be something rotting in the walls, or some serious mildew somewhere smell." And the second was their prices: starting at $344,900 for a rather large by one bedroom standards 825 SF unit. And moving up to $370K for the 2-bed main suite at 944SF. You'd think for those prices the developer would have at least stained or otherwise weatherproofed the extensive exterior stair sets. Just to put s further into perspective, you can get a brand new one-bed place in Tuscany Village for under $300K, roughly the same SF and a much nicer neighbourhood. With the excitement surrounding The Hudson, The Radius and other projects in the arena area, this neighbourhood is poised to become Victoria's urban place to live and work. It is seen as our "Yaletown." The revitalization is well on its way. Bay Street to Fisgard and Quadra to Douglas Street is set to explode for the discriminating metro living lifestyle. The Phoenix is the latest addition with three affordable apartment homes. Two two-bedroom homes and one one-bedroom loft style. The Phoenix starts at an unheard of $344,900. Being first in to this "up and coming area" will reap the greatest rewards. Don't miss out. Wow. I'd heard of the "Victoria's Yaletown" nonsense before. But never in my wildest imagination would I expect condo marketing to suggest it so far north and east of the two block radius that is Fisgard, Chatham, Douglas and Blanshard. I guess this is what happens in a world class city; pretty soon the VicWest revitalization is going to be referred to as "Victoria's Manhattan," the Humboldt Valley will be known as "Victoria's Park Place" and the new conversions going into lower Yates and Johnson will be known as "Victoria's Soho." "Victoria's Yaletown" at the corner of Quadra and Bay is, was, and always likely will be, the closest thing to "Victoria's Hells Kitchen" (of The Bronx). Except Hell's Kitchen has more culture, more excitement and very likely lower RE prices. This bubble is going to get ugly. I feel bad for people buying right now. Tune in soon to the next post where we almost buy a property but get talked out of it by... wait for it... a banker manager who hasn't got a single new mortgage on the books in a branch that has been open for almost a year. Yes, that's in the CRD too. And says he: "The Bear Mountain condos are in trouble, they have "investors" walking away from their contracts because they can't assign them." In plain language that means those that bought pre-sales hoping to "flip" their units before they're completed have now realized that they can't cover the mortgages with the low rents in the neighbourhood and would rather just lose their deposit than their shirts as completion looms. That is the disaster in the making that will blow the roof off this market. Sounds like we may not have to wait that long. The value of all property transactions through the Victoria Real Estate Board’s Multiple Listing Service® (MLS®) hit a new record of over $4.1 billion in 2007, up from $3.3 billion in 2006. The value of single family home sales was over $2.5 billion while the value of condominium sales was over $756 million. Victoria Real Estate Board President Tony Joe noted that both sales and prices for all major property types increased last year. "Last year was another exceptional year for the local real estate market. The total number of sales increased over 12 per cent while the overall average price for single family homes rose 8.5 per cent; the average for condominiums rose over 11 per cent and the average for townhomes rose 10.5 per cent," said Joe. Meantime, the sale of 14 single family homes in Greater Victoria over $1 million pushed the average price to a new record high of $624,450 last month; the median price, however, was considerably lower at $536,000. "It’s always important to bear in mind that the average price in a given month can often be significantly affected by the sale of high-priced homes," noted Joe. The six-month average for single family homes in December was $581,419. Before we see any changes, something is going to have to give. Year over year, we've seen listings increase, but we've also seen sales increase. What will we see over the next few weeks and months? Will listings climb while sales slide? 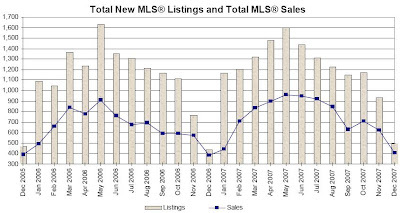 Will listings decline and prices increase with increased sales? If this trend continues, that "soft landing" that many economists have predicted will likely be the case. An 8.5% increase will just come back down to normal 5-6% gain, or slightly less. My YOY predictions, not to mention my month-month ones too, were completely out of whack. I over-estimated YOY SFH gains by 1.5%-2.5% and completely missed the boat on MOM; I guess some people got some high priced homes for Christmas this year. If you could look into a crystal ball and see that a crash is NOT coming, but a flat period of 5-7 years is, would you think about buying in the next couple of months? Greg has particularly good analysis on these numbers. What does BC Assessment say your house is worth: YOY? 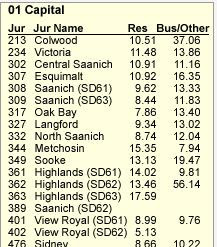 These are the CRD numbers. What do they tell us? Look closely. If you live in a municipality where "they just aren't making any more land" you'd think your house would have gone up in value more than say, Langford, or the Highlands, or View Royal, where they seem to be making a bit more land available. But that isn't the case. Hardly the great market it once was eh?